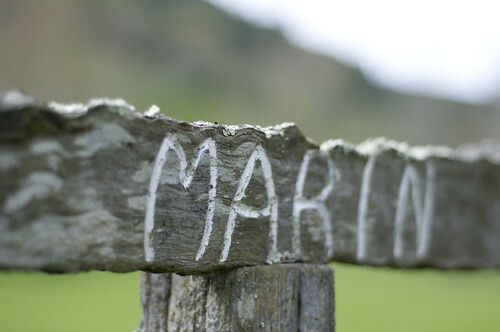 In the sprit of spring, Min and I took a drive out to Marin County. It's just an hour from where we live, but it seems a world away from the hustle and bustles of a big city. 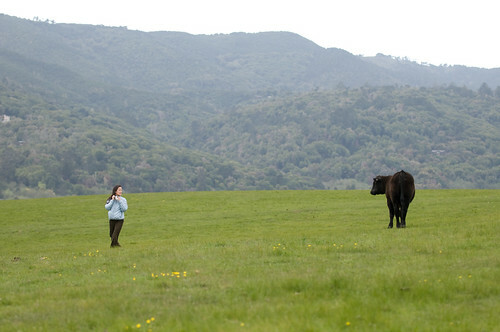 The sight of never-ending rolling hills and California Happy Cows grazing the vast grass fields still lingered in my memories from our last trip to Point Reyes Station, a simple and yet rich farming community tucked away in the northwest of San Francisco. 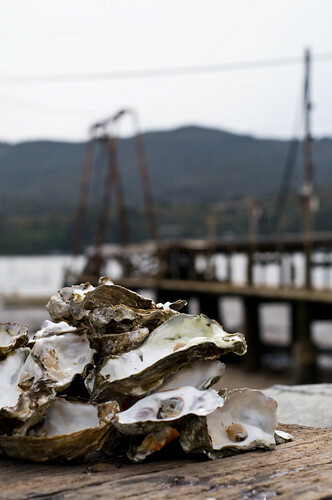 This time, we decided to check out an oyster farm in Tomales Bay, just 10 miles north of PRS. 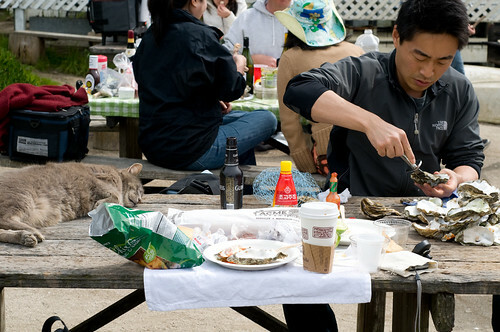 When we arrived at the Tomales Bay Oyster Co., there were already several groups of people picnicking and we were left with the very last table, which was occupied by a lazy fat cat taking its afternoon nap. We had no choice but to share the table with it, and it didn’t seem to mind at all; it only took a glance at us and went back to sleep as we took the seat next to her. And it didn’t even bother to wake up afterwards even as Min was banging on the table shuckling oysters. The oysters, even the small-sized ones, were so big, meaty and flavorful. Before we even knew it, we had finished all two dozen oysters (only $27!) with which Min labored very much shuckling and were left with a scar on one hand at the end. Nonetheless, we savored each fresh-shucked oyster topped with a splash of lime juice and Korean vinegary red pepper sauce (for me) and habanero Tobasco sauce (for Min). We longed for more fresh oysters but supplemented our lunch with cheese and baguette that we picked up on our way from a local creamery and left piles of finished oyster shells behind with hopes to come back again with friends and families later. Within 1908 the actual wrist watches. Obvious Workplace given Sheaffer the obvious upon their creation. Right now it had been feasible to make use of audemars piguet replica straight in the container as well as replenish the water feature pencil with no problems linked to the old technique. The actual Pelikan pencil organization has the capacity to find it's background back again more than 170 many years. Wagner utilized their loved ones crest in order to encourage the actual title as well as logo design for that rolex replica sale pencil organization. The actual Pelikan pencil organization created a brand new, extremely dependable water feature pencil refilling program. This utilized a little piston plus they known as this the "differential plunger". With this particular brand new creation these people produced their own very first water feature pencil within the rolex replica uk. High quality craftsmanship as well as rolex replica uk which are created within manually following framing as well as polishing tend to be hallmarks of the procedure. The actual Parker pencil organization is actually an additional company which has a background looking up back again more than a century. Similar to the Sheaffer pencil organization, the actual Parker pencil organization had been were only available in reaction to the problem. George rolex replica uk had been the instructor that trained college students how you can make use of the telegraph.